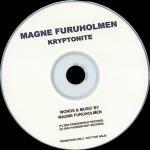 Magne released his first single "Kryptonite" in the UK on 14 March 2005. The cover of the single features a shot of Magne holding up his painty hands in front of his face. "Magne F" is printed across one hand in white letters and "Kryptonite" is printed across the other, also in white. The inside of the sleeve and disc features some of Magne's artwork. Track information together with web links are printed on the bottom left side of the inner sleeve. Magne F and the title are printed in black letters at the top of the disc, with the "Private and Confidential Records" logo on the left hand side of the disc. The CD contains only one track which is the album version of "Krytonite" (4:27). The single used for promotional purposes appears to be identical to the released version. Some promotional copies of the single have a sticker which reads "After 21 million albums sold and having written Take On Me, The Living Daylights, Cry Wolf, Hunting High & Low and The Sun Always Shines On TV, amongst many others, Magne F releases his debut single just prior to his first solo album Past Perfect Future Tense (on March 14). Keane, Coldplay, Travis and U2's The Edge all cite Aha as a major influence, and Will & Guy from Coldplay, Andy Dunlop from Travis & Ed Harcourt all join Magne on the the new album. Release date 7 March 05"
Other copies used for promotion have a smaller www.radiopromotions.co.uk sticker with telephone number, release date (07/03/05) and the text "solo project from Magne of AHA". There is a Norwegian promo CD-R of "Kryptonite" which doesn't have a picture sleeve. The disc is white with black text. The mix is slightly different compared to the regular version (3:53), noticable during the intro (around 3 seconds in). On 25 July 2005, the record label "ZYX-Music" released Magne's single "Kryptonite" in Germany. The cover features a shot of Magne's head and shoulders against a blue/grey background. Magne F and the title are printed in respectively black and red letters in the top right hand corner of the sleeve. The single includes "Kryptonite" (3:30) (Michi Peter Radio Cut), "Kryptonite" (4:25) (Album Version), No One Gets Me But You (5:02) and Kryptonite (Video). The inside of the front insert has a black and white side on shot of Magne on the left hand side with titles and track information on the right. The disc is white and also features the black and white, side-on, shot of Magne. "magne F kryptonite" is printed at the bottom with the catalogue number and "ZYX Music"-logo above. There are two diferent editions of the "Kryptonite" single available in Germany, one of which has a black rectangle printed on the right hand side of the front sleeve with the following text: "feat. magne furuholmen of a-ha, will champion and guy berryman of coldplay and andy dunlop of travis.". promo Kryptonite Passionfruit Records ?